A powerful novel about war, family and love, from the bestselling, prize-winning author dubbed `Pakistan's brightest voice' (Guardian) An American pilot crash lands in the desert and takes refuge in the very camp he was supposed to bomb. Hallucinating palm trees and worrying about dehydrating to death isn't what Major Ellie expected from this mission. Still, it's an improvement on the constant squabbles with his wife back home. In the camp, teenager Momo's money-making schemes are failing. His brother left for his first day at work and never returned, his parents are at each other's throats, his dog is having a very bad day, and an aid worker has shown up wanting to research him for her book on the Teenage Muslim Mind. 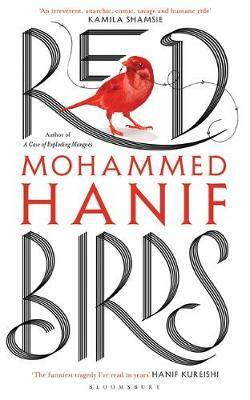 Written with his trademark wit, keen eye for absurdity and telling important truths about the world today, Red Birds reveals master storyteller Mohammed Hanif at the height of his powers. Mohammed Hanif was born in Okara, Pakistan. He graduated from the Pakistan Air Force Academy as Pilot Officer but subsequently left to pursue a career in journalism. His first novel, A Case of Exploding Mangoes, was longlisted for the Man Booker Prize, shortlisted for the Guardian First Book Award and won the Commonwealth Writers' Prize for Best First Novel. His second novel, Our Lady of Alice Bhatti, was shortlisted for the 2012 Wellcome Prize. He has written the libretto for a new opera Bhutto. He writes regularly for the New York Times, BBC Urdu, and BBC Punjabi. He currently splits his time between Berlin and Karachi.